typography can be inspired from the simplest thing . . . i new i would find enjoyment in these blocks i picked up a few weeks ago! are you the same caro chase doing the photo trade? if so, i have your info....are you in VA? yup - that's me! Can't wait to see what you send! I love this months theme - are you having fun with it? oh awesome! i think so. i've just recently started living on the "country side" so I'm eating fresh eggs and garden bounty every day! (: have a few shots to narrow it down from & will be sending in the next day or so. does this mean you have me? no - it's not pairs so you'll be getting a trade from someone else . . . its kind of cool how stana and jen work it all out - do you have a flickr? i do have flickr. it's just on private settings i think though. let me know when you get your photo! sorry i sent it so late. 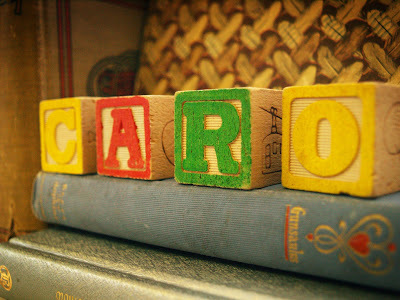 hey caro! just wanted to check and see if the photo made it to you alright? hi cara - i haven't gotten it yet, how did you send it?